If you’re lactose intolerant you may be able to eat ice cream in small quantities. Each person has a different degree of tolerance when it comes to lactose. Ice cream is primarily made from cow’s milk and contains about the same amount of lactose as a glass of milk, so if you can tolerate a glass of milk, a serving of ice cream should not pose a problem. If you do react adversely to drinking milk, you may be able to enjoy ice cream by using a lactase enzyme supplement. Talk with your doctor before using any medication to treat a medical condition. Most adults are intolerant to lactose to one degree or another, according to the health education website of the Mayo Clinic. During infancy when milk is the primary source of nutrition, your body produces copious amounts of lactase, the enzyme needed to properly digest lactose, a sugar found in milk. As you grow into adulthood and your body develops beyond the point where milk is intended to be your main nutrition source, your small intestine slows down the production of lactase, causing less efficient digestion of this particular sugar. Only people with significant symptoms are considered lactose intolerant. The condition is incurable and is most effectively treated with diet modification, according to MedlinePlus. The inability to properly digest the milk sugar causes irritation and inflammation in the gastrointestinal tract, leading to digestive complications. MedlinePlus states that common symptoms of lactose intolerance after eating ice cream include: bloating, diarrhea, gas, cramping, abdominal pain, foul-smelling stools and stools that float. Once the lactose is eliminated from the body, symptoms subside. A severe intolerance can lead to malnourishment, dehydration and weight loss. Talk with your doctor if you experience any of these symptoms. Ice cream contains a significant amount of lactose and needs to be discussed with your doctor before eating it if you are lactose intolerant. You can use an elimination diet technique to determine how much ice cream you can tolerate. Remove ice cream from your diet for a few days. Measure ¼ cup of ice cream and eat it entirely to see if you develop symptoms. If you don’t, try eating ½ cup of ice cream the next night. Continue to increase the amount of ice cream you eat by ¼ cup daily until you experience symptoms. This will help you determine how much lactose in ice cream you can tolerate. The Mayo Clinic states that lactose intolerance is treated by avoiding products that contain lactose, using an enzyme supplement or using substitutions. 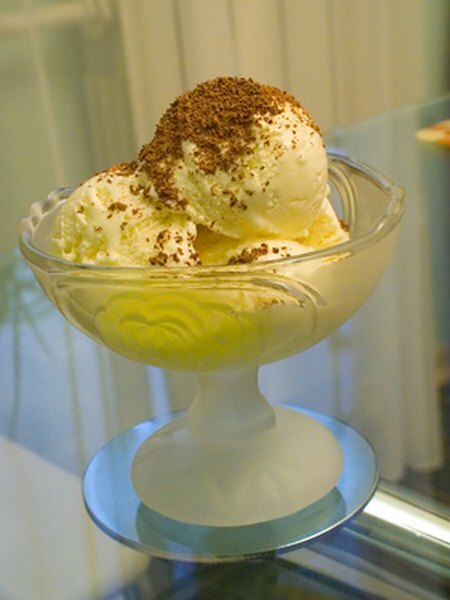 If you experience severe symptoms after eating ice cream, discontinue eating it. You may be able to purchase ice cream that is made with lactose-free dairy or you can take a lactase enzyme supplement with your first bite of ice cream to help the body digest the lactose. You can also purchase frozen treats that are soy milk or rice milk based.